What would you do if you were raised in Tampa, Florida, played ivy league football at Columbia University and then went on to work as an investment banker in New York City? Well, if your name was Chris Sullivan, you would conclude that there is more to life than that and opt to passionately pursue the call to service on your life. 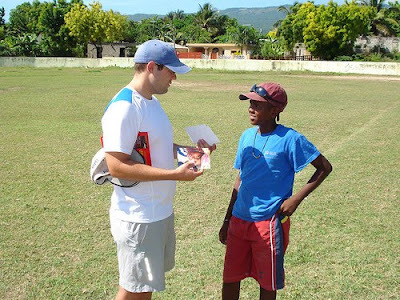 Chris has moved to Barahona, a poor rural area in the Dominican Republic, and is working with a program called I Love Baseball. The two things that make Chris feel most alive are service and supporting and encouraging others who step out in faith. For the most part I Love Baseball is working with kids that want to be baseball players. We are trying to address some of the problems that are created by young men dropping out of school and leaving home to pursue their dream of baseball glory. We firmly believe that we can replace the negatives that often come along with the pursuit of this dream with positives that are going to open doors for them and develop godly men who will be leaders who can transform their communities – whether they ever play a day in the big leagues or not. Even though we view baseball as a tool to work with these kids, it is easy to sometimes view baseball as the problem or the culprit. There is certainly plenty of blame to go around for the problems down here, and part of the blame does go to the culture and systems that have developed around baseball in the Dominican. The reality though is that there is massive potential to do good and change lives through baseball, and my favorite I Love Baseball player story really gets to the heart of that. My favorite story in the I Love Baseball program isn’t about a baseball player who discovered there is more to life than just playing baseball. It is the story of a young man with no parents and no plans or dreams of becoming a baseball player. A young man who literally traded our coach his machete for a pair of cleats and a glove. Baseball gave him a purpose and direction. Baseball gave him a family and he has become an amazing young man. I look forward to sharing more of his story with you as I get to know him better. His story reminds us of the redemptive quality of sports. How athletics can be a positive outlet for youths that keeps them off the street and and teaches them about teamwork, sportsmanship, dedication and hard work. We may not forget that side of athletics in the States, where sports has that kind of positive influence on many of our lives, but here in the Dominican, where youth sports is big business and the lessons and associations that go along with them can often be massively negative, it can be easy to look at baseball as the enemy. It isn’t. Around here the fun doesn’t start until after the sun gives way to other, more exotic forms of light. Evening, some call it. Other words also apply: sunset, dusk, nightfall. I’ve never cared for any of those words. To me, they fall short of their intended mark. Despite the reference to shiny vampires, I’ve always preferred the term “twilight.” That seems to effectively sum up that middle part of the day when night advances and daylight retreats. It’s an almost magical word, twilight. And as that struggle between night and day is both brief and seamless, magic seems a perfect definition. Here in the Virginia foothills, twilight magic can be found in the nearest field just after the deer have left and just before the whippoorwills begin to sing. There is a serene stillness that eases itself over the landscape, quieting the air. And then, flittering among the tips of the grass, will come a dash of light as fleeting as twilight itself. Lampyridea to the smart people. Fireflies to the normal ones. Summer’s version of winter’s Christmas. My wife and I sat on the back deck this past Fourth of July and watched as fireworks boomed over our neighborhood in starbursts and whorls. A wonderful sight. Also one largely ignored by our children, who were instead chasing fireflies around the backyard. It seemed to me both fairly ridiculous and utterly right. Ridiculous that the red, white, and blue explosions overhead were no match for the tiny yellow flickers right in front of us. Utterly right because we could only ooh and aah at the painted sky, but we could catch the fireflies. My kids think the purpose of the firefly’s twinkle is so they may be caught by seeking hands. It’s a bioluminescent dare, a challenge to come out and play. And it works. For all of us. Any adult worth his salt, no matter how jaded, will lurch for a firefly when it shimmers near. What sparks this reaction has always eluded me. But when my son managed to snag a firefly just before it flew out of his tiny reach, he offered me an answer. “I caught the happy, Daddy!” he yelled over the neighbor’s latest volley. He stared at the bug and smiled. “Can I keep it in a jar, Daddy?” he asked. He sighed in surrender and opened his cupped hand. Fingers wide, he then released it back into the night. Scientifically speaking, the firefly’s glow is the result of the luciferase enzyme acting on luciferin, ATP (adenosene triphosphate), and oxygen. The reason for this miniature fireworks show is much simpler than coaxing children to play a game, though. It’s to find a mate. To search through the darkness for something that makes the darkness worthwhile. Metaphorically speaking, the firefly is after what my children were that night. What we are all after every day. That’s a tough thing to find in this world. Like the sputter of a firefly’s abdomen, happiness is a fleeting thing, too. And often elusive. It shimmers and sparkles in the darkness of our lives, coaxing us to reach out and grasp. My eyes wandered from the fireworks on the ground to those in the air. Rocket’s red glare and bombs bursting in air is enough to make a guy like me think. We light the darkness every Fourth of July in celebration of more than a country, but an idea. One that says all men are created equal and endowed by their Creator with certain unalienable rights. The right of love, for instance. And liberty. That last one was what caught my attention that night. It was a powerful suggestion, one worth going to war. To our forefathers, God had given us the right to pursue our happiness. He had built the desire for happiness into the human heart. Placed it there on purpose. And He expected us to go looking for it. But that was where it ended. We had the right to pursue our happiness, but not to find it. Those were wise men. They knew the true state of humanity. Because we all are running around in the darkness chasing those fleeting shimmers. We’re all grasping for our happiness. Many times we’re a little too late or a little too off, and all we take hold of is more darkness. And sometimes that magic sneaks in and we take hold of that brilliance, cradling it in our hands and marveling at the sight. But like the firefly my son held, we need to know that the happiness we catch in life isn’t ours to keep. Do that, and it’ll die. No, better is to do what he did. To open both hand and heart. To give back what we’ve been given. This is a perfect time for you to do just that. To give back. Chris Sullivan is a friend of my tiny blogging world, and he’s about to go on a mission trip to the Dominican Republic. He’s a fantastic guy with a fantastic heart for God, and I’d like nothing better if you could pop OVER HERE and offer anything you can. Maybe a few dollars, maybe a little time, and surely many, many prayers. You’ll like him. I promise. Any guy who has sponsoring baseball players as part of his mission trip is tops in my book.